SeaSucker Bike Racks are the easiest to install and fit almost any car. They can be installed in under two minutes and removed in seconds. 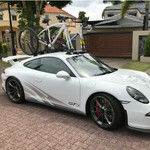 With over 6 years product experience no one else in Australia knows SeaSucker Bike Racks as well as we do. Not sure which SeaSucker Bike Rack is right for you? Please call us on 1300 877 119 or use LIVE CHAT. SeaSucker bike racks use industrial vacuum mounts which are non-marking, UV and weather resistant, and hold exceptionally well on glass, fibreglass, carbon-fibre, metal and aluminium surfaces. With a built-in orange indicator on the vacuum pump our Vacuum Mounts instantly display the holding power level. A single Vacuum Mount packs 90 kg of holding power.